In 1948 Gerda Frömel enrolled in the Academy of Fine Arts, Stuttgart and later went on to study in the Academy of Fine Arts Darmstadt and of Munich, where she studied metalwork and sculpture. While at art school, Frömel met the sculptor Werner Schürmann who she married in 1955. Following the birth of their first child, the couple moved to Ireland 1956. IMMA has included Frömel’s work in landmark exhibitions such as The Moderns (2010-2011) and a major retrospective of her work in 2015. Born in Czechoslovakia of German parents, Gerda Frömel grew up in Germany where she studied sculpture in Stuttgart, Darmstadt and Munich. Frömel moved to Ireland in 1956. Working in bronze, marble, alabaster and stainless steel, her early symbolist sculpture developed towards pure abstraction, capturing light and movement through the materials and simplicity of form. Frömel exhibited widely in Ireland from the 1950s. 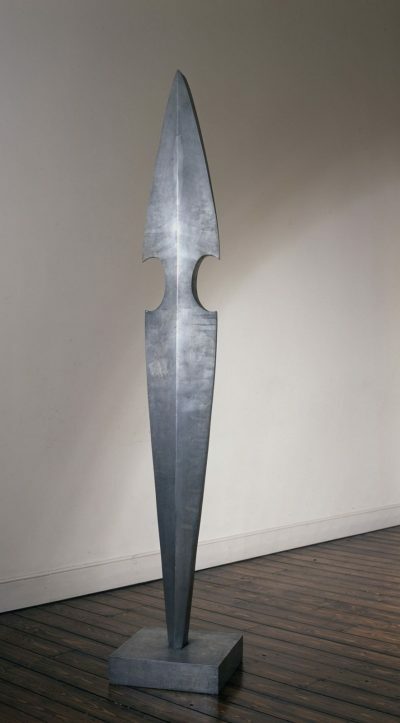 A major retrospective of her work was presented at Dublin City Gallery The Hugh Lane in 1976. While Frömel enjoyed an uneventful childhood in the former Czechoslovakia, her early experiences were marked by the trauma of the Second World War and the German Expulsions in its immediate aftermath. (2015 is the 70th anniversary of these expulsions). These experiences place her within a group of German artists – Joseph Beuys, Frank Auerbach, Eva Hesse and Georg Baselitz – whose work emerged from this post-war environment. In a country trying to come to terms with its recent past, physically, economically and spiritually, in some areas art saw a ‘return to order’. Various artists who had worked in an abstract style before the war, notably Henry Moore for instance, returned to a period of figuration as a means to process their need to reassert the primacy of the human body after years of witnessing its destruction. This political and cultural background marked Frömel’s development as she entered art school in the years immediately after the war. Frömel enrolled in the Academy of Fine Arts, Stuttgart in 1948 and later went on to study in Darmstadt and the Academy of Fine Arts in Munich, where she studied metalwork and sculpture. While at art school in Munich, Frömel met the young sculptor Werner Schürmann. They married in 1955 and the couple moved permanently to Ireland the following year where they lived in Woodtown Park, outside Rathfarnham where Schürmann established one of the only foundries in Ireland and began to cast their works in bronze there. Early works exhibited in the Irish Exhibition of Living Art were cast in bronze and figurative in style and included a portrait of her child entitled Portrait of Johann Jacob Weneslaus (1957) as well as images of animals such as Deer Crossing Bay (1963). In 1964 she embarked on her biggest project to date: a solo exhibition at the Dawson Gallery in Dublin. 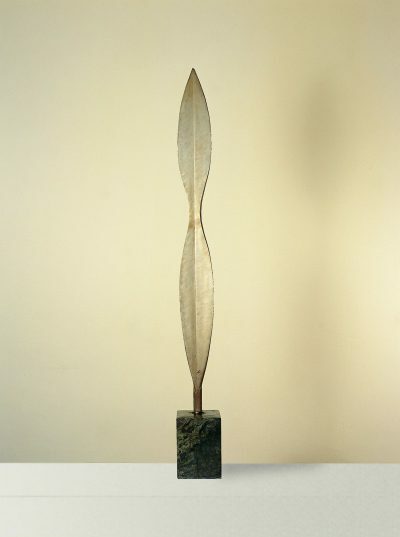 The works shown have clear connections to the Post-war aesthetics of phenomenological works in the style of Alberto Giacometti (1901-1966) with real-life observations of life and nature. Unusually within these early works, Frömel’s preference is for an uneven surface, and investment (plaster remnants left over from the casting process) can be seen, lending a somewhat unfinished appearance to the sculptures. This variation in surface is characteristic of Frömel’s work in other materials such as metal and stone; works that appear highly finished from a distance, on closer inspection reveal deliberate machining marks and chips. In the late 1960s Frömel made a transition from cast bronze sculptures to works carved in marble, granite, and her favourite material – alabaster. She made use of simple forms: circles, lines and spirals to communicate her observations from nature, natural phenomena and the celestial, in particular, the moon and its reflection were denoted with the simplest of visual codes. Between 1967-70 Frömel commenced her most important commission Sails, made for the Carroll’s Factory in Dundalk, Co Louth, designed by Scott Tallon Walker. The successful completion of the sculpture attracted significant positive attention in the press and it became emblematic of the building. At that point it was the largest private sculptural commission in Ireland, and one that would stand up to international comparison. After her death in 1975 her work continued to be championed by writers like Dorothy Walker, and was included in Rosc 1980 but was exhibited only rarely. Her work remains in the collections of The Arts Council, The Bank of Ireland, Allied Irish Bank, ACC Bank, The Crawford Art Gallery, Dublin City Gallery The Hugh Lane, Galway-Mayo Institute of Technology [GMIT], Limerick City Gallery, Trinity College Dublin and others. IMMA has the most substantial holding of Frömel’s work in a public collection largely due to acquisitions from the Carroll’s Collection as well as the Bank of Ireland. IMMA has included Frömel’s work in landmark exhibitions such as The Moderns (2010-2011) and held a major retrospective of her work in 2015; Gerda Fromel, A Retrospective, as part of the IMMA Modern Masters Series.